#TalkPay: Ready to tell the world how much you make? It's International Workers' Day and many are celebrating by posting their salary history on Twitter. "Good morning. Today is #talkpay and with 10 years of IT/support experience, I make $69k as a support engineer," tweeted @brookshelley. #Talkpay -- the suggestion of Pittsburgh programmer Lauren Voswinkel -- is inciting conversation from workers at tech companies including Squarespace, Yahoo (YHOO), Facebook (FB) and Google (GOOG). It is currently one of Twitter's top 10 trending topics. "Without a general understanding of the ranges of salaries their peers are earning, many people are left to simply throw a number on the table," wrote Voswinkel in a preview post on Model View Culture on Tuesday. Voswinkel kicked off the conversation, tweeting: "I'm a Sr. Software Developer w/ 9 yrs. exp. working remotely from Pittsburgh, PA for a DC based company. I make $122k/yr." Like Voswinkel, many point to pay transparency as a way to close the wage gap. Women earn about 78 cents to a man's dollar, according to the Bureau of Labor Statistics. That doesn't take into account factors like education and profession, although the gap persists even when you drill down. And it's even more pronounced for black women (64 cents) and Latinas (56 cents). While many employees trust that companies compensate them fairly, it's easy for unconscious bias to creep in during the hiring and promotion processes. This could make the difference of tens of thousands of dollars a year. Stephanie Morillo, a copywriter in the Bronx, said she first read about #Talkpay earlier this week. As a woman of color, Morillo said she wanted to help more minorities participate. When she saw that few were chiming in on Twitter, she said she would share anonymized pay information for those who sent her direct messages. "A lot of people don't want to be identified by their employers" she said, adding that a "few dozen" people of color have reached out to her already. According to Voswinkel's post, tech companies often instill fear in employees about disclosing their salaries, but retribution for talking about pay is actually illegal. Still, many are sharing how much they made in past jobs, but not disclosing current salaries. @Krystynheide, a design director at Levo, shared her pay history in a series of tweets, including: "#talkpay Squarespace (2006 - 2013) Started at $48k, no benefits, working remote. Ending salary $105k, perks, best insurance in industry." But when it came to her current job? "#talkpay Levo (2014-Present) I definitely can't disclose. But I can say it is a good balance of pay, social good, and work I love." The potential for retaliation isn't the only thing holding some people back. @justkelly_ok tweeted, "No secret I worked at Google, but hesitating to tweet pay there on #talkpay. Embarrassed by privilege & don't want 2 sound braggy. Should I?" She then did: "At Goog, as of last July when I left: senior SWE, Bay Area, 8 years experience, $156k salary, roughly $100k stock, $32k bonus. 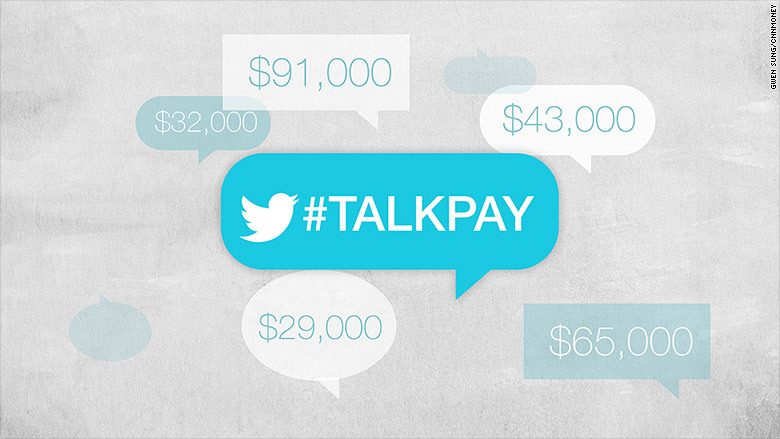 #talkpay"
For some, the conversation is eye-opening. @samhouston said it was "depressing" to see someone making $80,000 more than him with similar experience. But another Twitter user notes that salary alone doesn't tell the full story. "You can't just throw numbers out there... you have to take into consideration many factors, like race, age, location etc... #talkpay" tweeted @giron. "i'm seeing a really suspicious absence of white male tech workers in #talkpay. really, guys? tell us what you make," tweeted @shanley, founder of Model View Culture. "you sharing your data will help bring awareness to the income gap, help your colleagues determine if they are paid fairly," she added.